PHILADELPHIA, PA--(Marketwired - Feb 17, 2015) - The 2015 Philadelphia Flower show is set to spring forth once again, this February 28th through March 8th and the Philadelphia Marriott Downtown is poised to bring guests closer than ever to the experience. The annual festival takes place at the Pennsylvania Convention Center, connected to the hotel via skywalk. This year, Marriott offers guests a Philadelphia Flower Show package, which includes an overnight stay, breakfast and tickets to the event. Guests who book the Philadelphia Marriott's exclusive hotel deal will receive two tickets to this year's show downtown, and wake up to a freshly prepared complimentary breakfast. The package is priced from $219 per night and is valid throughout the show's run, seven days a week. Parking is additional. Travelers booking the special can use offer code P42 to book online. This year, the show honors the cinema with its "Celebrate the Movies" theme. Attendees will feel like stars as they browse exhibits that bring the silver screen to life in lush and vibrant floral arrangements. Some garden designers will use Disney and Pixar films as inspiration for their exhibits, with floral displays set to highlight some of the most beloved movies from the studio's iconic collection. The Philadelphia Flower Show is a storied city tradition, and is the world's longest-running and largest indoor flower show. Honored with the 2014 Grand Pinnacle Gold award as the world's top event by the International Festivals & Events Association, the show is one of the city' most popular seasonal celebrations. From its beautiful entrance garden to its many artistic displays, countless award-winning arrangements will be on display throughout its week-long run. The Philadelphia Inquirer calls it "Perennial Pleasure." 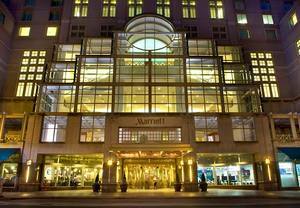 Located just minutes from the convention center, the Philadelphia Marriott Downtown hotel is prepped to serves as many attendees' prime gateway to the revered annual event. Commanding a distinctive presence with its towering profile in the heart of Philadelphia, the Philadelphia Marriott Downtown's location surrounds guests with rich, revolutionary history and culture reflective of the city's 18th century service as the nation's capital. Exceeding the expectations of both business and leisure travelers, its accommodations are near the Pennsylvania Convention Center and within eight blocks of Independence Hall and the Liberty Bell. Fine restaurants can be found onsite or within walking distance along with some of the city's best shopping and entertainment venues. The nearby 30th Street Train Station makes it easy to arrive by regional rail and guests are just 10 miles from Philadelphia International Airport. Chic guest rooms, spacious suites, elegant event venues and impeccable service set the standard at this downtown hotel. Guests who book the Philadelphia Marriott’s exclusive hotel deal will receive two tickets to this year’s show downtown, and wake up to a freshly prepared complimentary breakfast.